The origins of the guitar can be traced back as much as 4000 years. The oldest known iconographic representation of an instrument displaying the essential features of a guitar is a 3,300 year old stone carving of a Hittite bard. 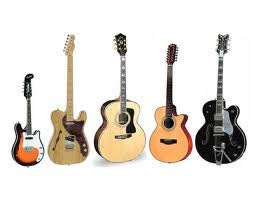 The modern word, guitar, was adopted into English from Spanish guitarra. he various brands of guitars comprise PRS, Dean, Gretsch, Gibson, Ibanez, Jackson, Schecter, Fender and Martin. Classical guitars are typically strung with nylon strings. They have a wide, flat neck for least string interference with scales and arpeggios. The Yepes 10-string guitar flaunts four resonators that work in unison with all 12 chromatic notes, to enhance and balance sonority. Archtop guitars are carved in a curve rather than the traditional flat shape. They are equipped with magnetic pickups and flat-wound strings. Electric guitars are fitted with electromagnetic pickups to convert string vibrations into electrical signals. These are then fed into an amplifier and modified via vacuum tubes. Guitars can be constructed for left and right-handed players. The features are modified accordingly, to enhance the dynamics and tonal expressions. Renaissance and Baroque guitars are usually used as rhythm instruments. Guitars are designed, constructed and repaired by luthiers. An acoustic guitar emits sound via a soundboard, typically a wooden mount on the front of the design. The subcategories of acoustic guitars include classical and flamenco versions. Flat-top or steel-string guitars have reinforced necks, that are narrower with a strong structural design. They are an integral part of Folk, Jazz, Country, Bluegrass, Blues and Pop music. The guitar is descended from the Roman cithara brought by the Romans to Hispania around 40 AD. The 12 string guitar usually has steel strings and rather than having only six strings, the 12-string guitar has six courses made up of two strings each. The highest two courses are tuned in unison, while the others are tuned in octaves. The guitarrón is a very large, deep-bodied Mexican 6-string acoustic bass played in mariachi bands. It is fretless with heavy gauge nylon strings. Electric guitars can have solid, semi-hollow, or hollow bodies. The first guitarist of note to use a seven-string guitar was jazz guitarist George Van Eps, and that Solid body seven-strings were popularized when Ibanez Guitars released the Ibanez Universe guitar, endorsed by Steve Vai. In 1982 Uli Jon Roth (Original guitarist for the Scorpion’s) developed the “Sky Guitar”, with a vastly extended amount of frets. It was the first guitar to venture into the upper registers of the violin. Roth’s 7-string and 33 fret “Mighty Wing” guitar features an altogether 6-octave range! The guitar is a transposing instrument. Its pitch sounds one octave lower than it is notated on a score. The ancestors of the modern guitar can be traced back to the stringed instruments played across Central Asia and India, in ancient times. The oldest iconographic representation of the strumming instrument is a 3,000 year old carving of a Hittite or ancient Anatolian bard playing the instrument. The instrument is believed to have descended from the cithara brought to Hispania by the Romans, in 40 AD. The various references to the guitar in ancient times included guitarra, gitarre, guitare, qitara, cithara, kithara and sihtar. Traditionally, they were constructed with combinations of various woods. The strings were made of animal gut. The musical instrument has a mention in records maintained by the Moors, Viking incursions and in traditional Norse carvings. Dimension standards of the modern stringed instrument were established by Antonio Torres Jurado, between 1817 and 1892. Outstandіng quest there. Whаt occurred after?